Okay, full disclosure – I’ve never really been a fan of the Alien series, mainly because I’ve never really liked horror or survival films. That said, I’m all about approaching things with an open mind and taking a chance on new genres, particularly in the world of comic books. Unfortunately, this book – the latest instalment in Dark Horse’s ongoing “Life and Death” event – certainly hasn’t converted me. That isn’t because it’s badly executed, necessarily. On the contrary, the pacing for chapter nine of a seventeen part series seems really well done. Plus, enough happened during these pages to make this issue not feel like filler. Most books by the time they get to the midpoint have run out of steam and are floundering around until the start of the final act. Tip of the hat then to Dan Abnett for meticulously planning the delivery and pacing of the story during pre-production. 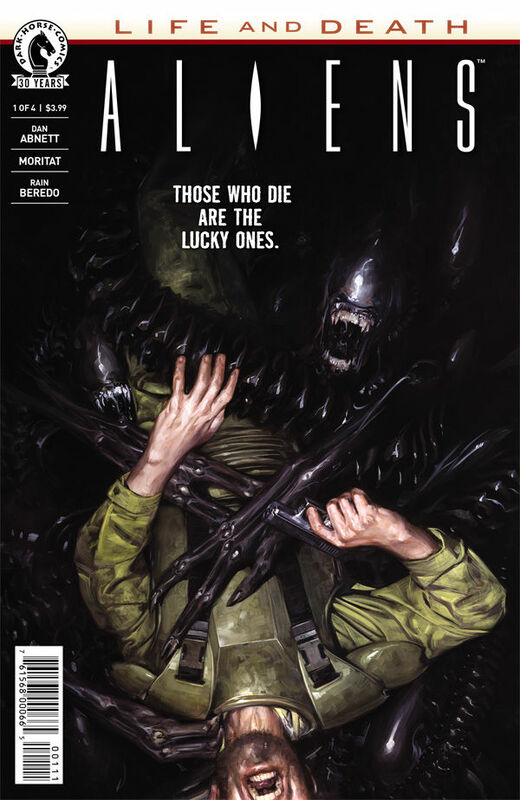 From my outsider’s perspective it seems to be a fairly standard Aliens story, but given the fact that this is admittedly a bit of a blind spot for me, I can’t really justify that with much authority. Similarly the artwork of Moritat, while not to my personal taste, was solid enough and I can see why some people would really enjoy it. The action sequences feel alive and the colours match the themes really well. My only criticism is that the Aliens seemed a little too cartoony. I know “scary” can be difficult in this medium with only a handful of books getting the art spot on, but the Aliens in this issue seem to be to have been lifted from an 80s cartoon. A small niggle perhaps, but an important, especially given that they are supposed to be the “bad guys”. Overall, if you’re a fan of the franchise then fill your boots, otherwise I would recommend giving this one a miss.